Quinoa burgers are a popular trend right now. I have made them a few times and my biggest struggle is getting the consistency just right so they don't crumble apart. This recipe seems to be perfect! It is full of flavor and packed with protein. from the quinoa and egg. This little guys really hold the heat so be careful when you take that first bite! Cook quinoa (boil about 1/2 cup of water to the 1/4 cup of quinoa, add more water if not cooked enough). Sauté kale in oil in a medium size pan until it is a little tender. Mix the cooked quinoa, kale, egg, cheese, salt & pepper and bread crumbs in medium bowl. Cover bowl loosely and put in the refrigerator for about 30 minutes or until cool and firmer. Form balls and press into patties any size. I made two patties but you could go smaller if you would like. In your medium size pan, add a little oil to coat the bottom if there isn't any left from cooking the kale. Put on medium heat. When the pan is hot, place the patties in the pan. Be careful of splattering oil. Let the patties brown on both side - a few minutes each side. You want the cheese to melt a little and the egg to fully cook. You can cover the pan if it is splattering (this will help the egg cook faster). Saute onions in butter on medium low heat until they translucent and beginning to brown. 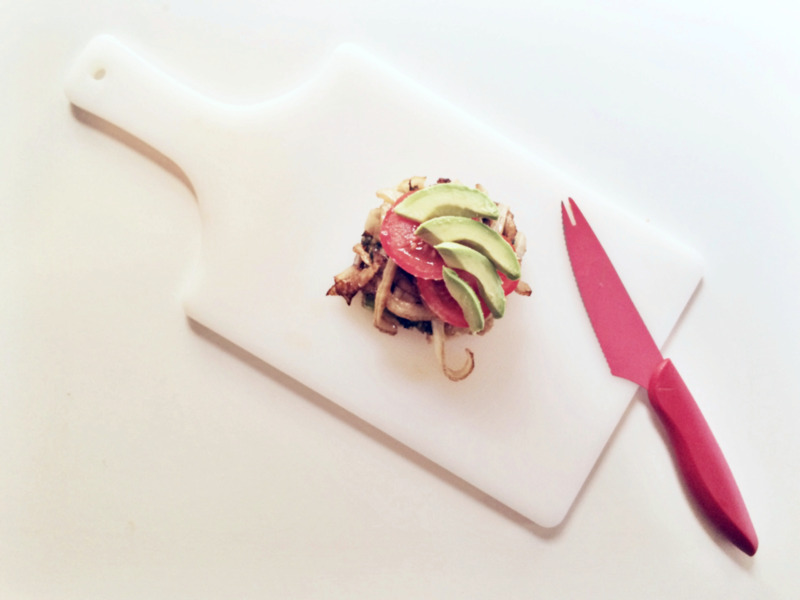 Plate your burger and top with onions, tomato, and avocado. You can drizzle balsamic vinegar on top if you want some added flavor (I think it is perfect without!). I only ate one patty so I put the other in the refrigerator for another quick meal!